You know what’s one of my biggest challenges with NaNoWriMo? Finding time to go to the grocery store for the weekly shopping. I remember when I was lying on the sonographer’s table and saw my twins in utero for the first time (BIG surprise), one of my first thoughts was how am I going to grocery shop with three little kids? But I figured it out: one baby in the car seat in the cart itself (yes, groceries piled around her), one in the baby carrier, my (then) two year old in the kiddy seat. As time went on, it morphed into one twin in the kiddy seat, the other in the carrier on my back and my little boy on foot. This arrangement worked beautifully for a long time. So, here’s the thing: I go out on Thursday nights alone. I go and write. There are times when I go and read or stare at nothing. I just like being alone while drinking my nice little latte without anyone touching me. Once, my husband jokingly said on my Thursday night, “You look nice,” (which meant, I think, oh you showered). “You going to meet some guy?” And I said, “No. The last thing I want is someone touching me or trying to talk to me.” This was when we were in the thick of two babies and a toddler, when the best personality trait a person could possess was the ability to hold it together when presented a broken cracker. So, ever the optimist, and attempting to preserve the sanctity of my Thursday night writing time, I decided to try shopping with them again. 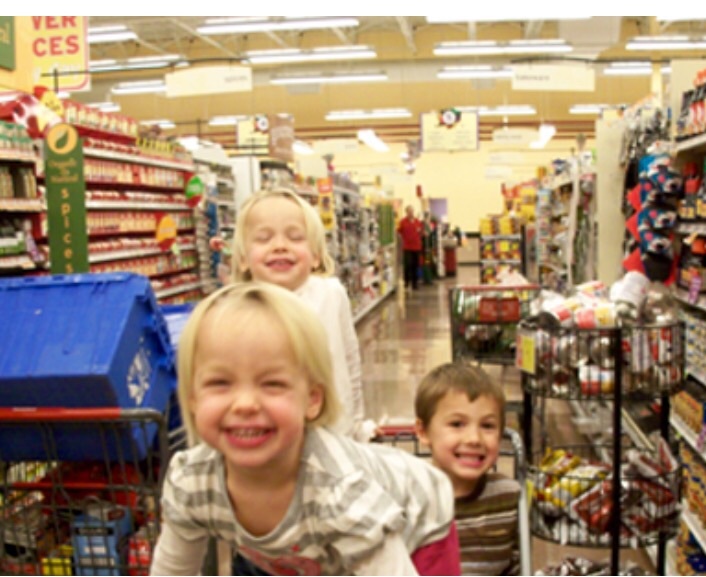 This was the next facebook post:Remember that time I said I would never go grocery shopping with the kids again? Well, I mean it this time. Getting to the point, I started using part of my Thursday nights to grocery shop, sans kids. But it’s NaNo time now and I cannot afford to utilize any of my precious Thursday nights for anything but writing. (See? This does have something to do with writing!) I was more determined than ever to make our grocery shopping together work. Damn it. My new tactic: two carts! One for the kids, one for the food. You saw the photo of the kids at the top of the page. That photo documents a semi-good moment in the shopping experience. Soon after, they were dumping water on the floor and doing Downward Facing Dog from the top of one side of the cart to the top of the other. All while chanting the words to “Five Little Monkeys” as loudly as possible. Then they commenced to freak out at the check-out when they realized that it was logistically impossible for them to place (throw) the food onto the belt from their cart. I defied the laws of physics and figured it out. I’m sure someone from MIT will be contacting me. Long story short, I really mean it this time. But not on Thursday nights. I gotta write. I still managed to stay mostly on track this week. A little behind but I will catch up this weekend! How’s your NaNo project going?